Add value to your home and create a beautiful low maintenance space for you to enjoy. Your Deck Company. Your deck contractor and partner in design. Give your family and friends a beautiful, social, outdoor living space to catch up and create new memories. Make your property more inviting, comfortable and desirable without adding to your list of home maintenance chores. Your deck contractor should be a partner, with the technical training and practical experience to bring your vision to life. That’s the kind of deck builder we are. 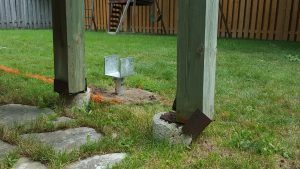 We accept 1 project at a time and dedicate our 30+ years’ experience entirely to your family’s low-maintenance, long-lasting deck. And we stand behind it with a standard 5 year warranty on our workmanship. We truly are Your Deck Company, and you can completely reimagine your outdoor living space when you partner with us. What does your dream deck look like? 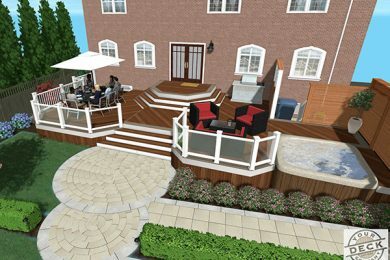 Bring your biggest and best ideas to your deck design and consultation meeting. Whether you’re shopping for a hot tub deck, multi-tiered deck, rooftop deck, walkout basement patio, or any combination, your family deserves the best version of your vision. Your deck contractor should share your vision and values. Let us make your space come to life. The world’s #1 decking brand. WHY CHOOSE YOUR DECK CO. Founded by Todd Mounsey back in 1986, Your Deck Co. has established itself as one of the most experienced, knowledgeable and prestigious deck builders today. Decking specialist, designer and TV personality Todd Mounsey is often called upon for his expertise. Check out our in The Media section. This allows us to focus only on your project. 340000+ construction hours of integrity, dedication & experience. Call and find out if we’re the right deck contractor for your family. Partner with us from concept to completion and get the quality you want. Or visit our gallery to see recent deck builds for families just like yours. Want a little more info before picking up the phone? And if you’re ready to talk about your vision, book an appointment and get started today!